Illustration: Disclaimer – just trying to make triggers for my memory. The name was given to me when I failed to quit my job at an appliance warehouse. Working at the appliance warehouse was a good experience. God has a plan for what we are enduring. He has a plan for where we are that will lead us to where He wants us to be and who He wants us to become. If we don’t quit on God we will know what we need to learn. 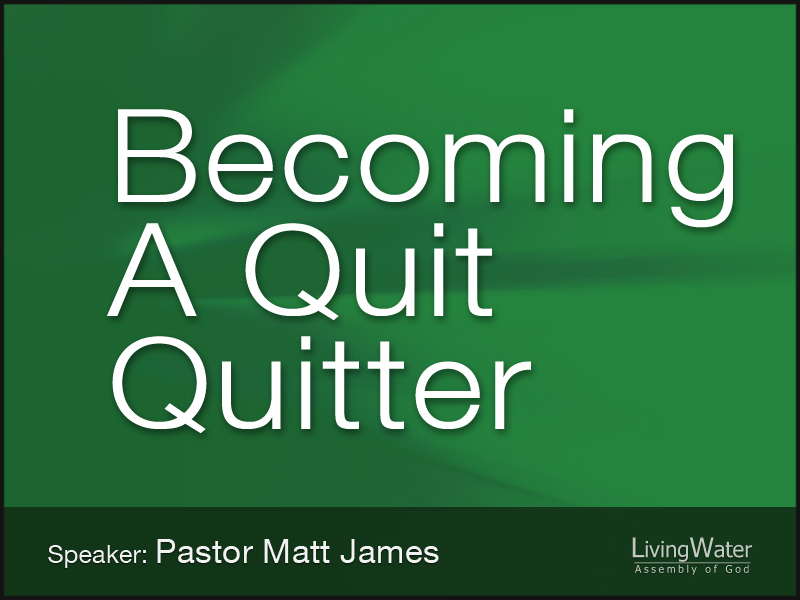 While my experience was not an awful one the idea of developing a non-quitter mentality is important. Paul used a very real hurt in his life to bring us to an attitude of perseverance. Quitter synonyms from Microsoft Mac: pessimist, defeatist, dark horse (a competitor that has little or no chance of winning) and fatalist. It’s not good to have these or to share them with others. They are infections like bad diseases. 2Cor. 1:8 We do not want you to be uninformed, brothers, about the hardships we suffered in the province of Asia. We were under great pressure, far beyond our ability to endure, so that we despaired even of life. 9 Indeed, in our hearts we felt the sentence of death. But this happened that we might not rely on ourselves but on God, who raises the dead. 10 He has delivered us from such a deadly peril, and he will deliver us. On him we have set our hope that he will continue to deliver us, 11 as you help us by your prayers. Then many will give thanks on our behalf for the gracious favor granted us in answer to the prayers of many. Paul wants to give us some good information about difficult times. Because we all face difficult times so it makes sense that the thing we need to encourage us is some good information. The truth about God informs us of His goodness and brings hope in a difficult situation. Difficult times can bring considerable amounts of pain to our lives! We can become sick with worry and obsess with the “what ifs”. We can lose our courage and lose hope for a better tomorrow. We can become fearful about the immediate future and frozen where we stand. We can become confused and panicked about the direction or the destiny of our lives or our loved ones. So many of us know that it’s not easy going through difficult times. S. Lewis – Hardship often prepare ordinary people for an extraordinary destiny. I just checked and yes, we are ordinary people! We can’t give up when things get tough. Bull ridding has 8 seconds. A marathon has 26.2 miles. MMA championship has 5 minutes for 5 rounds. Boxing has 3 minutes for 12 rounds. Everything has a time limit. Eternity is a huge time limit and that is extraordinary. Life can be like getting kicked off a bull so when that happens run to God immediate! The disciples asked Jesus who sinned that the crippled man would be born like that, him or his parents? Neither, but this happened that the Glory of God may be revealed through him. If I gotta go through this then the enemy is gonna pay for it and I’m gonna grow through it and God is gonna be glorified by it. And maybe someone will be saved because of it. We need to go a little further into this dark subject and be real about our pain. No one needs to explain my pain to me, I know it. How many of us are in pain physically or emotionally? Those who know your pain can identify with you. We can lose hope even in the promises and goodness of God. In my pain I find myself in need of help because I want to quit! I have quit on God many times in my life and I found out one constant truth through it all: it hurts worse to quit. Sin is a form of quitting on God because He is constantly trying to change our pattern of living from the sinful to the faithful. Don’t quit trusting in God when He has brought us through so much and He will continue to bring us through to the end. Paul says that this happened for a reason – So that we would rely on Jesus. Hard times can bring serious brokenness. I would like my uncle to give his life to Christ. I would like some things in life to be easier. I would like to take back some decisions I have made in the past. Wherever the pain comes from one thing is true: it is for us to learn to rely on God. So that saying, “no pain no gain” is true. But where would we put our hope be if it weren’t for Jesus? I want to rely on Jesus because I want to see His miracles! Not giving up on God during hard times brings some amazing stories. Look what Paul gained by not quitting when hard times came. How many people were encouraged to partner with him in ministry? How many people give thanks to God for Paul’s ministry? How many people have found God’s favor through persistently living for God? How many prayers have been answered because some people refused to quit? We need to quit quitting on God and prepare ourselves for some great stories! Putting our hope in Christ gives great resolve to our faith in a very perilous world. God knows that a stubborn faith in Him is what every Christian needs to pull through the difficult times. We can’t trust something that is not strong with our lives. People don’t climb the face of glaciers because they are busy falling apart. We would be misguided to put our hope in a world that is shaken by “mother nature” or in sinful people that continually fall apart themselves. Jesus didn’t fall apart during any part of His ministry even up to the cross so I can rely on Him that He will not fall apart on any part of His promises. Paul wants us to set our minds on things above so that we will benefit here below. The song is simple but the visual is inspiring. The further down we go in humility the higher our voice is heard. Like when Peter was sinking down he reached out for Jesus and He was there to grab his hand. Jesus knew that Peter was going to disown Him and He reached for him anyways. NOTE: The hands that have the scars are continually reaching for the hands that caused them. This is the mystery: Why would God who is good give His life for mankind who is sinful? Mysteries are meant to be solved and this one is a life long experience with Jesus that brings us to that full understanding of God’s love. When we humble ourselves to God we step into this mystery where we experience first hand the unfailing and unending kindness and mercy of God. God said through Isaiah 29:19 Once more the humble will rejoice in the LORD; the needy will rejoice in the Holy One of Israel. We can’t quit when Christ is so near and so strong and so good. Prayer: Even when we quit on You, You have never and will never quit on us. You are faithful from beginning to end. You will bring to completion all that You have started in us. You will bring us through this perilous world, not unscathed but secure. Secure in Your promises. Secure in who You are. Help us to be faithful to You. Help us to trust in You through all the difficult times that come.